1915-17: Attends classical gymnasium, one of six workers' children among 45 students. Likes math best; does average work, poorly in foreign languages. 1917: Great October Socialist Revolution. 1921: Family moves to Kursk. 1922: Starts work at factory. 1920s: Performs in amateur theatrics. 1924: Starts land management and reclamation technical school, Kursk. 1928: Sent to Urals, first to Mikhailovsky, then Bisertsky raion, where he's made head of raion land department. 1929: Made candidate member of Communist Party. 1930: Dnieper threatens to flood factory; Brezhnev made head of Emergency Flood-Control Commission. 1930 (?? ): Made vice chairman of Bisertsky executive committee (raiispolkom). 1931: Made deputy head of Ural Okrug land directorate. 1931 Oct 24: Made full member of Communist Party. 1932: Made party organizer at metallurgical institute; then chairman of trade-union committee; then secretary of institute party committee. 1933: Becomes director of evening metallurgical workers' school. 1935: Graduated Arsenich Metallurgical Institute in Dneproderzhinsk (Kamenskoye); thesis "The Design of Electrostatic Cleaning of Furnace Gas in the F.E. Dzerzhinsk Factory" graded as "excellent"; gets professional designation of "engineer-heat power plant worker"; becomes shift foreman at factory's power plant; Plant's newspaper Znamya Dzerzhinki noted "he is made of strong metal." 1935 Nov: Drafted into army. First goes to tank school in Zabaikal military Okrug; then is a political instructor in tank company. 1936: Director Dneproderzhinsk Metallurgical Technical College. 1937: Beginning of Stalin's great terror, i.e., `Ezhovshchina", creating many vacancies in party and government posts. 1937 May: Made deputy chairman of executive committee (ispolkom) of Dneproderzhinsk City Soviet. 1938 May: Named head of a dept, Dnepropetrovsk Obkom; gets nickname of "ballerina"(RM.96). 1939 Feb: Secretary, Dnepropetrovsk Obkom, in charge of Defense Industry. 1941 Jun: After Nazi invasion, works to evacuate population and factories; participates in choosing underground workers to be left in area; has rank of regimental commissar. 1941 Jul: Sent to front. 1941 Oct: Made deputy head of political administration, Southern Front; rank, brigade-commissar. 1942 Mar: Gets first order--Order of the Red Banner for participation in successful Barvenkovo-Lazovskaya operation, commanded by Malinovsky; when asked to describe the fighting, all he says is, "It was hard." 1942 autumn: Sent to Caucases and made deputy head of political administration in the Chernomorsky group, Zakavkaz front. 1943 Jan: Rank changed to colonel (renaming, not promotion). 1943 Apr 1: Made Chief of Political Department, 18th Army; around this time, makes acquaintance with Major-General A.A. Grechko; possibly also meets Suslov and Kirilenko. 1943, April-May: Takes part in battle around Malaya Zemlya, Novorossiisk. 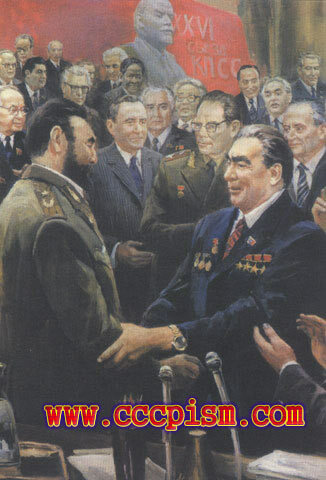 "Until Brezhnev transformed it into a major battle 30 years later, it was a minor episode of the war."(ZM.217). 1943: German offensive in northern Caucuses stopped. 1943, autumn: 18th Army now put in 1st Ukrainian front; Brezhnev now subordinate to Khrushchev. 1944 May 1: Brezhnev, along with 500,000 other soldiers, receives "For Defense of the Caucuses" medal. Other war-era medals he eventually gets: second Order of the Red Banner; Order of the Red Star; Order of Bogdan Khmelnitski, 2nd class. 1944 Nov 2: Made Major-General. 1945 May 12: Made Head of Political Administration, 4th Ukrainian Front. (Official bio says its Jan; archivist says it's May); meets end of war in Prague. 1945 Jun 24: Marches in Victory Parade, Red Square; then named chief of Political Administration, Prikarpatskii Military Okrug (formed from 4th Ukrainian Front). 1946 Aug: Demobilized from Army, made 1st Secretary, Zaparozhskii Obkom, Ukraine; his 2nd Secretary is A.P. Kirilenko. 1947: Gets Order of Lenin for work in reconstruction of Zaporozhstal Steel Factory. 1947 Nov 21: Named 1st Secretary, Dnepropetrovsk Obkom. 1949 Jan: Elected member of Central Committee of the Ukrainian Communist Party. 1950, spring: Elected deputy to Supreme Soviet of the USSR. 1950, spring: Sent to Moldavia as representative of Central Committee. 1950 Jul: Elected First Secretary in Moldavia. Works there with Chernenko. 1952 Sep: First All-Union article published in "Bolshevik"; article entitled "Criticism and Self-Criticism--A Proven Method of Cadre Education". 1952 Oct: Delegate to 19th Party Congress; elected to congress's mandate commission; gives speech on fourth day of congress. 1952 Oct: Elected to Central Committee of the Communist Party of the Soviet Union at 19th Party Congress. 1952 Oct: Elected Candidate Member of Presidium (formerly Politburo) and Secretary of the Central Committee. Relieved of duties in Moldavia, but not given any new assignments. 1952 Nov 7: Seeing Brezhnev, Stalin says, "What a handsome Moldavian". (Might have occurred in Oct at Party Congress--RM.67). 1953: Removed from Politburo and Secretariat. 1953 Mar: Appointed head of Political Directorate of the Army and the Navy, with rank of Lieutenant-General. 1954 Feb: Made 2nd Secretary in Kazakhstan at start of virgin lands campaign. 1955 Aug: Made 1st Secretary of Kazakhstan; (previous 1st Sec, P.K. Ponomarenko, was a Malenkov man). 1956 Jan: Kunaev elected to Bureau of CC Kazakhstan. 1956 Feb: Made Secretary and candidate member of Politburo; given control over defense industry, space program, heavy industry, and capital construction. 1957 Jun: Presidum's recommendation to oust Khrushchev rejected by Central Committee. Brezhnev supports Khrushchev. During heated arguments, Brezhnev, suffering a verbal attack from Kaganovich, faints. (RM.87). 1957 Jun: Elected Member of the Presidium of the CPSU Central Committee. 1957 Oct: Sputnik I launched. 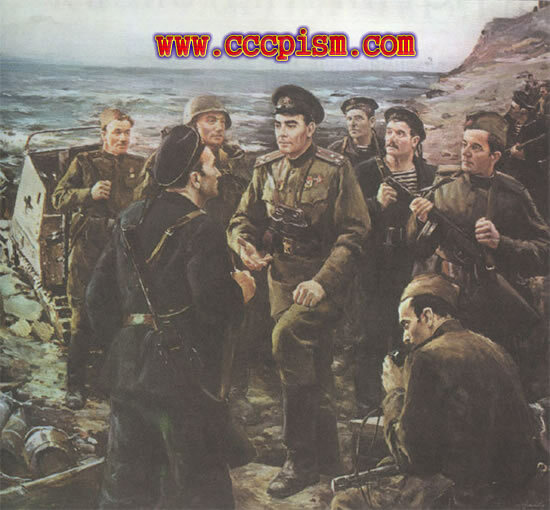 1958: Made Deputy Chairman of CC Bureau for Russian Federation Affairs (Bur CC CPSU of RSFSR). 1959: Visits American exhibition in Moscow. 1959: Elected Second Secretary of CC. 1960 May - 1963: President of the Presidium of the Supreme Soviet of the USSR. (Giving up Secretary position). Gets reputation in West as best-dressed Soviet leader. 1960 Sep: Visits German Democratic Republic. 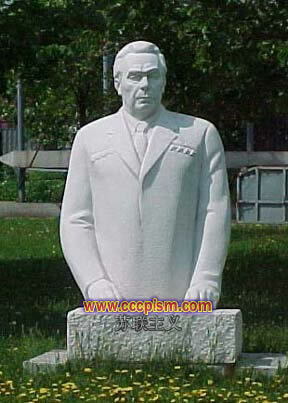 1961 Apr: Following Gagarin's space flight, Brezhnev is made Hero of Socialist Labor for his contribution to the development of rocketry and for ensuring the success of the space flight. 1963: Elected Secretary of CC, replacing Kozlov. 1964 Apr: Delivers main speech at Khrushchev's birthday party. 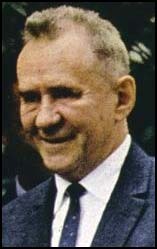 1964 Oct 5: Leads delegation to East Germany for its 15th anniversary. 1964 Oct 14: Elected First Secretary of CC CPSU. 1964: Named Chairman of Defense Soviet. 1965 May: In speech commemorating 20th anniversary of defeat of German fascism, mentions Stalin positively. 1965 May: Given Hero of Soviet Union in recognition of his wartime service. 1965-1966: Prior to 23rd Party Congress power struggle emerges between Suslov and Shelepin as possible First Secretaries. This only improves Brezhnev's position. 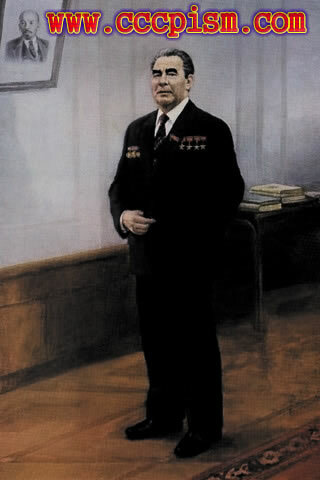 Podgorny and Kosygin support Brezhnev because a "weak" First Secretary improves their own security. 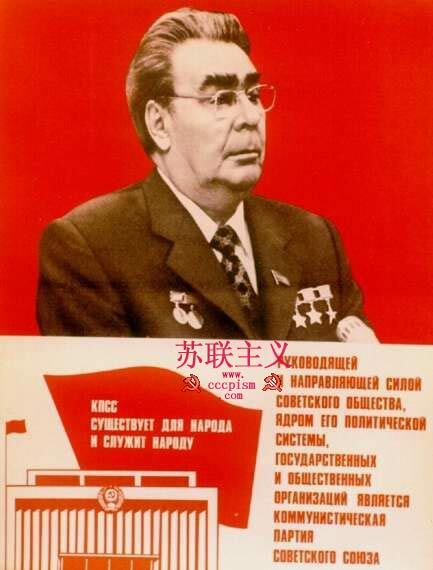 1966 Apr: 23rd Party Congress deletes regulation about mandatory regular changes in leading party posts; changes Brezhnev's title to "General Secretary". 1966 Dec 19: 60th Birthday. Given Hero of Soviet Union Medal. 1967 May: Semichastnii removed as head of KGB; Shelepin removed from post of Secretary. 1967 Dec 8: Visits Czechoslovakia. 1968: Gets Order of Lenin with Gold Star and title of Hero of the Soviet Union for bravery during the war. 1968 Feb-Mar: Participates in Plenum of Moscow City Committee in which policy of "tightening of the screws" in ideology and culture is openly declared. 1968 Aug 20: Soviet and Warsaw Pact troops enter Czechoslovakia to suppress Prague Spring. 1969, spring: Border clashes with China. 1969 Dec: Rehabilitation of Stalin planned for celebration of his 90th birthday. Plan aborted after protests for Polish and Hungarian parties. 1970: Kulakov becomes candidate member of Politburo. 1972 May: Nixon visits Moscow. Detente begins. 1972 May 26: Brezhnev & Nixon sign SALT Treaty. SALT II Negotiations begin. 1972 Oct: US & USSR reach agreements on marine shipping, settlement of lend-lease accounts, credits, and trade. 1973: Visits Czechoslovakia. Says, "Many pages in my life are associated with your beautiful country." 1973 May: Visits West Germany. 1973 Jun 16: Arrives in USA for state visit. 1973 Jun 19: Meets with members of the U.S. Senate Foreign Relations Committee. 1973 June 22: Signs Agreement on Prevention of Nuclear War with the US. 1973 Jun 24: Delivers address on American TV. 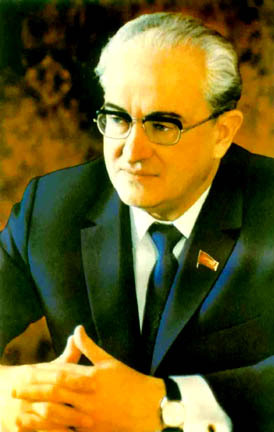 1973: Andropov becomes full member of Politburo. 1973 Jul: Awarded Lenin Prize "For the Promotion of Peace Among Nations". 1973 Nov 26: Arrives in India for a visit. Concludes treaty of peace, friendship and cooperation. 1974 Summer: Nixon visits Moscow. 1974 Nov 23: Ford-Brezhnev summit in Vladivostok. 1975 Feb: Reemerges in public. 1975 Feb: Soviet-British summit in Moscow with Harold Wilson. 1975 Jul: Apollo and Soyuz spacecraft take off for US-Soviet linkup in outer space. 1975 Jul: Meets visiting U.S. Senators. 1975 Jul 31th: Addresses Conference on Security and Co-operation in Europe, Helsinki. 1975 Sep: Meets Soyuz-Apollo astronauts in Kremlin. 1975 Oct: French Preisdent d'Estaing visits Brezhnev in Moscow. 1975 Nov: Awarded F. Joliot-Curie Gold Medal of Peace. 1976 May 28th: Signs Treaty on Underground Nuclear Explosions for Peaceful Purposes with the US. 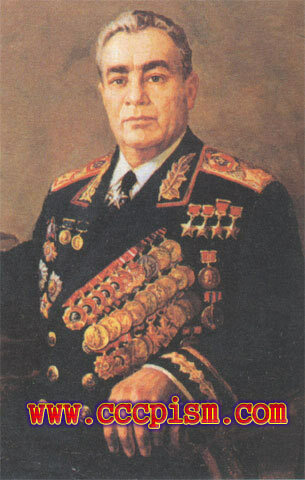 1976 May: Given rank of Marshal of the Soviet Union. 1976 Oct: USSR concludes treaty of friendship and cooperation with Angola. 1976 Nov: Given Czechoslovak decorations. 1976 Dec 19th: 70th Birthday. According to official biography, "He was in the prime of his creative strength and energy." 1977 Jan: Gives speech in Tula. 1977 Mar: Gives speech at 16th Congress of Soviet Trade Unions. 1977 May: Draft of new Constitution ready. 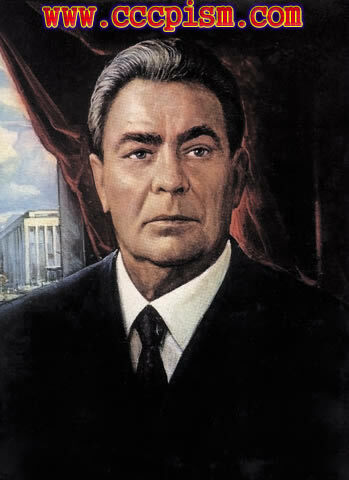 Brezhnev is chairman of Constitutional Commission. 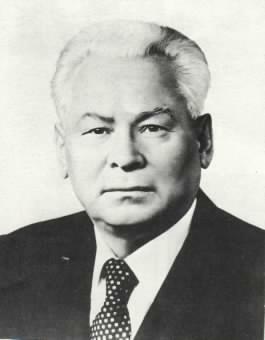 1977 Jun 16: Elected President of the Presidium of the Supreme Soviet of the USSR, replacing Podgorny. 1977, September 21: Nuclear nonproliferation pact signed. 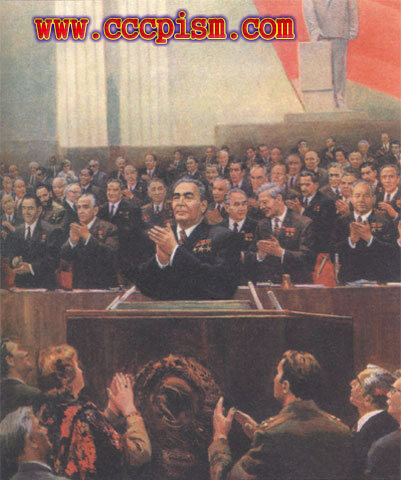 1977 Oct 5: Supreme Soviet meets to begin discussion of new Constitution; Brezhnev gives speech. 1977 October 7: New Constitution adopted. Brezhnev gives speech acknowledging contribution of many, including M.S. Gorbachev. 1977: Chernenko, Brezhnev's personal chief of staff, made candidate member of Politburo. 1978 Feb: Presents Hero of Socialist Labor award to Kulakov on his 60th birthday. 1978 May: Visits West Germany. 1978 Jul: Absent from Kulakov's funeral (as are Kosygin & Suslov). Reason for death unclear-officially, his heart "stopped". 1978 Sep: On way to Baku, stops in Mineralnye Vody; met by Gorbachev and others who report on good harvest. 1978 Nov 27: Gorbachev made Secretary of CC, responsible for agriculture. Shevarnadze elected candidate member of Politburo. Chernenko made full member of Politburo. 1979 Jun 14: Signs SALT II with Carter. 1979: Gorbachev becomes candidate member of Politburo. 1980: Following American grain embargo, preliminary work done on 10-year Food Program. Work on this program was Gorbachev's chief task. 1980: Sakharov exiled to Gorky. 1980: Bad harvest. Topsoil erosion accelerates. Food imports increase. 1980 Oct: Gorbachev promoted from candidate to full member of Politburo. 1981: 3rd bad harvest in a row. Food Program must be delayed. 1981 Feb 23: Addresses 26th Party Congress. 1981 Mar 3: Final Session of 26th Congress. 1981 Apr: Visits Czechoslovakia for 16th Czech Party Conference. 1981 May 9: Dedicates Ukrainian State History Museum of the History of the Great Patriotic War in Kiev. 1981 May 5: Lays wreath at eternal flame in Tbilisi. 1981 May 25: Meets Georgian Party leaders in Tbilisi. 1981 May 27: Meets Jordan's King Hussein. 1981 Jun 2 & 17: Give medals to cosmonauts. 1981 Sep 15: Gives medals to ministers of defense of GDR and Cuba. 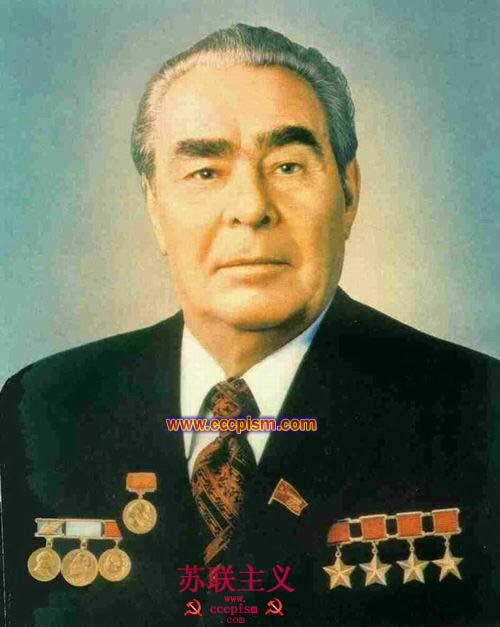 1981 Sep 24: Gives Order of Lenin and second Hammer and Sickle Hero of Socialist Medal to Chernenko. 1981 Oct 26: Meets Pres. of Yemen Arab Republic Ali Abdall Salekh. 1981 Nov 2: Talks with Indira Ghandi on phone. 1981 Nov 3: Published interview with West German "Spiegel". 1981 Nov 16: Gives speech at Party Plenum. 1981 Nov 22-25: Visits West Germany. 1981 Dec 4: Meets with Warsaw Pact ministers of defense. 1981 Dec 15: Meets scientific delegation from Vatican. 1981 Dec 16: Gets "Sun of Freedom" medal from Afghanistan's B.Karmal; meets with Arman Hammer. 1981 Dec 19: 75th birthday. Receives Order of Lenin and "Gold Star-Hero of the Soviet Union" medal. Also receives medals from Bulgaria, Hungary, GDR, Romania, Czechoslovakia. 1982 Mar: Scheduled announcement of Food Program delayed because Brezhnev is ill.
1982 Mar 3: Meets with Jaruzelski, 1st Sec & Chairman of Soviet of Ministers of Poland. 1982 Mar 16: Addresses 17th Congress of Trade Unions. 1982 Mar 17: Gets Gold Medal from International Federation of Trade Unions. 1982 Mar 18: Meets Laos Prime Minister K. Fomvikhan (sp?). Gets Laos's "Golden Medal of the Nation". 1982 Mar 23: Visits tractor factory, airplane factory, and kolkhoz near Tashkent, Uzbekistan. 1982 Mar 24: In Uzbekistan, gives republic Order of Lenin. 1982 Mar 25: Meets with Uzbek CC. 1982 Mar: On way back from Uzbekistan, suffers mild stroke. Is unconscious for several days; lost power of speech for several weeks. 1982 May 4: Meets Nicaragua's D. Ortega. 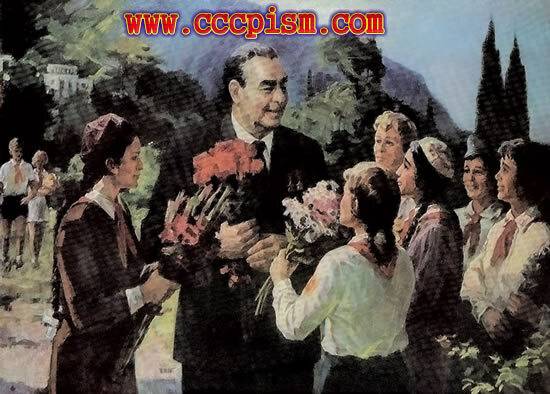 1982 May 18: Gives speech at 19th Komsomol Congress. 1982 May 26: Meets with Austrian President Kirchslager (sp?). 1982 May 26: Get medal "In memory of the 1500th anniversary of Kiev". 1982 May 31: Gets Order of Ho Chi Minh from Lee Zuan. 1982 Jun 2: Meets with CSSP's Husak. 1982 Jun 22: Meets G. Filipov, Chairman of Bulgarian Soviet of Ministers. Gets Bulgarian medal. 1982 Aug 16: Meets with Jaruzelski (sp) in Crimea. Chernenko there. 1982 Sep: In Baku, reads wrong speech for seven minutes until an aide points out the error and gives him the right speech. 1982 Nov 7: Stands for hours in the cold on Lenin's Mausoleum to watch parade. 1982 Nov 10: Dies from heart attack at 8:30 A.M.